The new Imo state Police Commissioner, Rabiu Ladodo has promised to consolidate on the legacies of professional dexterity and sterling leadership style established by his predecessor, Dasuki Galadanchi. 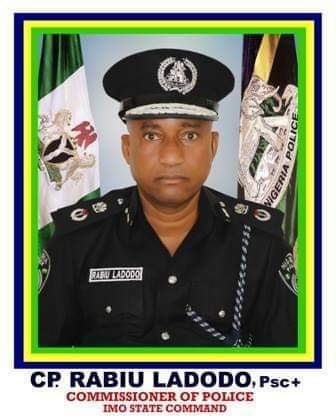 Ladodo stated this in his maiden press briefing as the 34th commissioner of police in Imo state, which took place on Thursday, April 4, 2019, at the command headquarters, Owerri. He stated that what he met upon assumption of office was a crop of officers that can best be described as hardworking, dedicated, loyal and determined which is contrary to the general perception that the road block loving police officers in Imo state are more interested in extortion of money from motorists, than securing and safe-guarding the citizenry’s life and property. He however expressed great optimism that Imolites will continue to enjoy relative peace, assuring that safety and security will be provided in all nooks and crannies of the state. The release reads in part, “my main target is to provide justice to humanity, that is to say, that this Command under my watch will ensure that justice is done to everyone, seeking justice irrespective of social status, tribe, religion, ethnicity, class, position, etc. It is noteworthy therefore, that respect for human rights is paramount to me. To this end, I want to inform members of the public that the Complaint Response Unit (CRU) has been activated and fully energized to perform optimally. Members of the public are advised to report any genuine grievances against any erring police officer for prompt action. This will serve as feedback mechanism for the Command as well as help check the excesses of our men in order to ensure effective service delivery”CP Ladodo assured. Like the say goes, “you cannot determine how impressive or poorly the market sales would turn out to be with the early morning rush”. Many in Imo are of the view that the way to go for Compol Rabiu Ladodo is to end the serial extortion by the police controlling trafic at the different round abouts in Owerri. They complain bitterly of the unrepentant extortionist tendency engendered by the police in the state and condemned in its entirety such attitudes, where even at the government house roundabout, police road block, the men and officers engage in whole sale extortion in full public glare. The same is the situation at the heavy traffic laden control post road block where a particular young officer is always threatening motorists with death, if they fail to part with their hard earned money.